The arctic grayling (Thymallus arcticus) is related to salmon, trout, and whitefish. Instantly recognizable by its large, sail-like dorsal fin, the arctic grayling is considered a trophy species by traveling anglers and fly-fishing enthusiasts. Large individuals sometimes reach 30 inches in length and can weigh 8 pounds or more. The arctic grayling is one of North America’s northernmost freshwater fish. These iconic fish are native to drainages of the Arctic Ocean, Hudson Bay and northern Pacific Ocean in North America. The species also occurs in Asia. Like other salmonids, arctic grayling inhabit a variety of habitats. The species is often found in cold water lakes. Fluval (river dwelling) populations also exist throughout Canada and Alaska. Arctic grayling are often seen leaping, especially during insect hatches. They readily take flies and other lures that resemble local food sources. The Arctic grayling is an official symbol of Canada’s Northwest Territory. 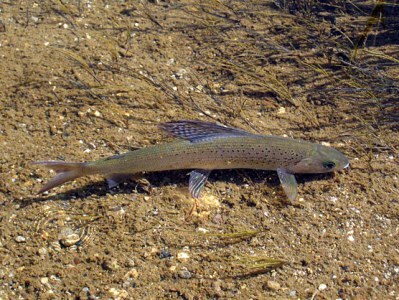 Other names for the species include Alaska grayling.